(Miami, FL, 9/8/2016)- The Council on American-Islamic Relations - Florida (CAIR-Florida), the state's largest Muslim civil liberties and advocacy organization, today announced that the Palm Beach County Court found Belle resident Yousef Mohammad Muslet not guilty of burglary with a battery and battery on a person 65 years old. Unbelievably Muslet, a South Florida Muslim, was facing up to life in prison for talking about Allah, and shaking a man's hand. The man who filed charges against Muslet waited nine days to call the police and only then because he was scared Muslet was a radical Muslim merely because he was talking about Allah. 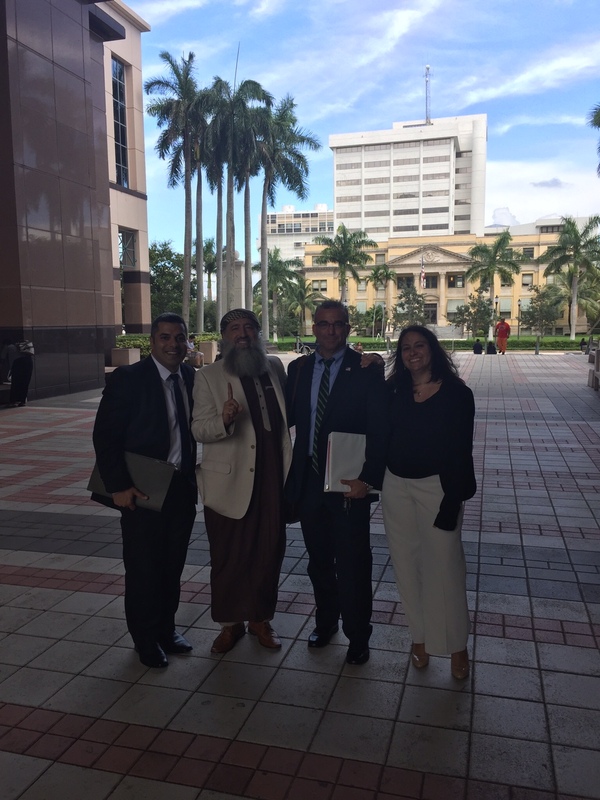 Representing Muslet at trial was West Palm Beach criminal defense attorney Flynn Bertisch, CAIR-Florida's Civil Rights Director, Thania Clevenger and CAIR-Florida Civil Rights Attorney Omar Saleh. This past Wednesday September 7th, at around 3:30pm, and after five hours of hearing witnesses' testimonies and recorded evidence, the Palm Beach County judge confirmed that a conversation about God and a handshake should not be considered a crime and acquitted Muslet. 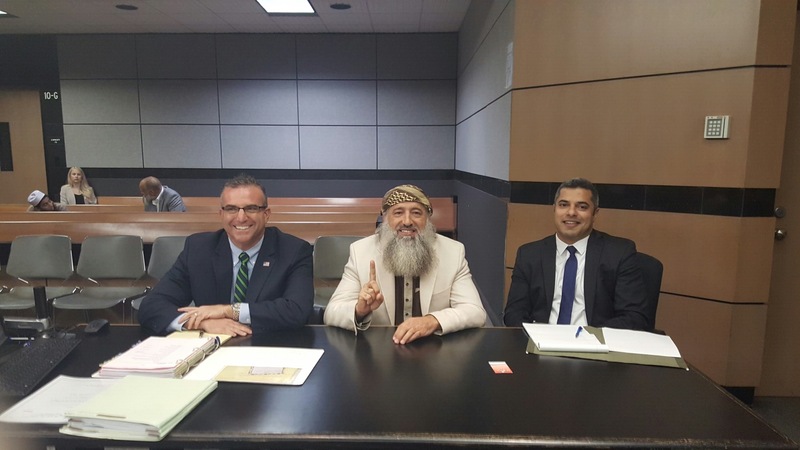 Criminal Defense Attorney, Flynn Bertisch; Yousef Mohammad Muslet; and CAIR-FL's Civil Rights Attorney, Omar Saleh at West Palm Beach County Court. The incident leading up to the trial started last December when Muslet was outside of his home with his children and two men leaving his neighbor's party stopped their truck to honk at kids in the street. Muslet approached the truck, introduced himself, shook the driver's hand and briefly spoke with the driver about Islam and his desire to visit the local Baptist church. Nine days later, Muslet was arrested at his home after being identified by Hal Howard, the truck's driver. At trial, the judge found the testimony and recorded evidence to be inconsistent, along with a lack of any adequate investigation leading up to Muslet's arrest.The driver Howard alleged that Muslet, dressed in traditional Islamic garb, shook him violently through his truck window as he tried to leave the party. Repeatedly, Howard mentioned that his reasons for reporting had everything to do with Muslet being a Muslim. Muslet maintained that he only shook the driver's hand and the testimony from Howard and the witness corroborated his account. "CAIR-Florida will do everything in its power to ensure Mr. Muslet is made whole again after this glaring injustice," said CAIR-Florida's Civil Rights Director Thania Clevenger. "Handshakes are meant to bring us together; not tear us apart," said Lead Defense Counsel Flynn Bertisch. CAIR-Florida is the state's largest Muslim civil liberties and advocacy organization. Its mission is to enhance the understanding of Islam, encourage dialogue, protect civil liberties of all people, empower American Muslims, and build coalitions that promote justice and mutual understanding. "La misión de CAIR-Florida es mejorar la comprensión del Islam, fomentar el diálogo, proteger las libertades civiles, capacitar a los musulmanes estadounidenses, y construir coaliciones que promuevan la justicia y la comprensión mutua."